Going gluten free in January of 2013 was easy for us: we basically had to make 3 substitutions in our routine diet and it was done. Our favorite breakfast was built around triticale, a hearty grain that is a cross between wheat and rye, which was replaced by gluten-free oats. Our much-loved Turkish bulgur for lunch was replaced with brown rice. And quinoa instead of pasta became the starting point for most dinners. Both corn and brown rice tortillas worked their way onto our lunch menus for more variety. The change was easy from a shopping and cooking standpoint and our guts were so much more comfortable after even a couple of days that there was no going back. Of course the transition was made easier by having dropped pizza and all baked goods from our diet decades ago. I anticipated that spending 3 months in Central Europe, primarily in the Italian Alps, would be a huge strain on our gluten free diet and it was. Our usual diet in Europe was muesli for breakfast, tuna and hearty bread for lunch, and pasta for dinner. Having been there many times before, I knew that canned beans and cheese would be our most reliable source of gluten free calories. We are both also lactose intolerant and the lactase enzyme product so readily available in the US is scarce and wildly expensive in Europe, so between us we hauled 1,250 high-potency lactase tablets with us to brace for at least twice daily servings of dairy. We basically eat a vegetarian diet with fish and occasionally chicken tossed in, so meats wouldn't be a substantial source of nutrition. And should there be any wavering about going back to meat under the new dietary stresses, another onslaught of research was released in the US the week we arrived in Europe again implicating red meats and eggs as a major source of cardiovascular disease because of the affect on GI bacteria. So, we'd clearly be looking at beans, tuna, and diary for our basic diet. The good news was that in January 2012 the EU implemented new rules on the labeling of foods in regards to gluten. As will be the case in the US starting in August 2014, "Gluten Free" signaled that the gluten protein present in a food was at or below 20mg/kg or 20ppm (parts per million). The EU allowed a second category "Very Low Gluten" for foods at or below 100mg/kg to permit a wider selection of foods for gluten intolerant individuals recommending however, that they go easy on the "Very Low Gluten" to be safe. We never saw any foods in 2013 marked "Very Low Gluten". Our first serious shopping for gluten free in Europe was in Innsbruck, Austria. One of the major food chains, M Preis, carried a corn and rice gluten-free pasta that was more palatable than the brown rice versions we'd tried in the US. The couple of gluten-free packaged breads contained the additive xanthan that gives Bill severe indigestion, so they were out. The bread wasn't a big loss because we had found gluten-free breads in the US to be barely eatable and wildly expensive. None of the few sidewalk bread shops we checked with in Innsbruck (or later, Frankfurt) had gluten free products and they clearly thought we were crazy for asking. It was on the gluten-free pasta that I first encountered the new EU symbol for gluten free, which was an encouraging starting point. The graphic was standardized but the color was not, which made it a little harder to use. And in addition, the symbol was a little too close to that used on their "bio" or organic foods to allow it to be a speedy reference point. But clearly gluten free had become more of an issue in Europe than when we were there a year prior because "Gluten Free" was now showing up on foods we regularly purchased, like chocolate bars. In Austria and Germany it would be worth looking for 'glutenfrei' in Reformhaus and other health food stores, which are common in the cities. We weren't in these countries long enough in 2013 to shop in these specialty stores. I only visited 2 supermarket chain stores in Germany in our brief stops in the country. The Rewe near the Munich train station had a respectably-sized "glutenfrei" section with numerous bread products, several shapes of pasta, and a muesli cereal. The discounter Kaufland near the Hannover train station didn't appear to have a glutenfrei section but had some well-labeled products on the shelves with their gluten counterparts, like rice and corn cakes. 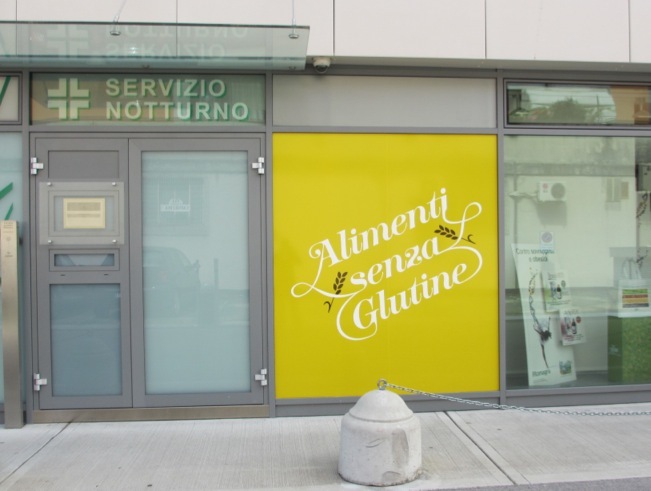 The pharmacy in Riva del Garda, Italy boldly promoted their gluten free products. Each major store I visited in our first days in Italy had a brand of gluten free pasta. I also discovered that the pharmacy in Riva del Garda had a big inventory of gluten free. Of course, it was all at pharmacy prices, and so quite expensive. The products available were primarily pastas, breads, and sugary Italian breakfast cookies. We were content to go to the grocery store next door for less expensive pasta and skip the bread and cookies altogether. If you are in a jam for gluten free products, especially in a smaller community in Italy, check with the pharmacy because they might order products for you. The European pharmacies in general carry a small inventory and rely on same day and next day delivery from their distributors to provide both prescription and non-prescription products. 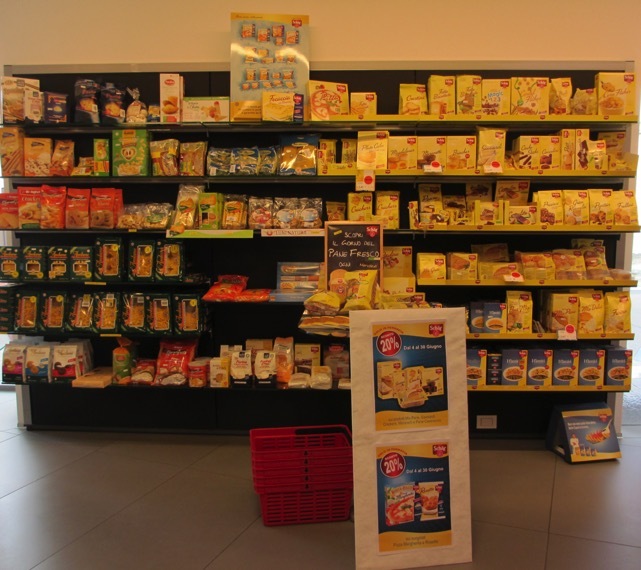 The Despar supermarket chain (including EuroSpar, InterSpar, and Spar) in Italy has a "Free From" line and participating markets often display a chartreuse logo on the store window. It's a small product line of 1-3 shapes of gluten free pastas and an assortment of Italian breakfast cookies and sweets. Their "ditalini" or bead-sized pasta is more palatable than the penne or fusilli which we normally prefer. Some of these markets will also prominently display "Senza glutine" labels on foods like their cornflakes that are displayed next to the gluten containing product. The Conad supermarkets also have a gluten free product line, "AC", though it was only well represented at a single market of the several I shopped. Other markets were hit and miss for gluten free. In some towns the Coop stores commonly seen in the mountains had 1-2 shapes of pasta and others had absolutely nothing, without apology. And surprisingly, the little "alimentari" or mom and pop neighborhood market, outside of Canazei stocked 1 type of gluten free pasta. My biggest early disappointment in Italy (which is where we spent most of our summer in 2013) was not finding gluten free oats. One grocery store had a bag of boutique oats but they were clearly labeled as "contains gluten." And even the product line that the pharmacy stocked which had many cereal products lacked a gluten free oats. We only had a whistle stop in the Netherlands but the single, standard grocery store I visited had a small gluten-free section with 1 type of pasta and a small assortment of breads, crackers, and cookies. The biggest surprise was that neither this store nor the nearby discounter Lidl carried corn cakes, only rice cakes. Part way through our trip we learned about the high arsenic content in rice so dropped all rice products from our diet. The absence of corn cakes outside of Amsterdam threw us a curve for our quick breakfast on the way to the airport the next morning which was to be corn cakes and cheese. This was the first country in which corn cakes weren't readily available. Additives: "E" numbers are standardized abbreviations for food additives used in the EU. You can look online to see what's in your food with wiki being an easy place to start. For example, E249-E252 are the sodium and potassium nitrates and nitrites that we avoid and E220-E228 includes most of the sulfites. Beans, canned: plentiful in Italy, especially their favorite "Fagioli borlotti" which are similar to a pinto bean; garbanzos "ceci;" and lentils "lenticchi"; though black beans are scarce. Where ever you are in Europe, if you can't read the language on the label, only buy beans with 3 ingredients listed on the label because those 3 ingredients are always beans, water, and salt. If there are more than 3 ingredients, they've probably added a meat product, except when buying lentils in France and Italy where the 4th ingredient is usually tomatoes. Bread: gluten-free bread can be found in some grocery stores and many pharmacies. 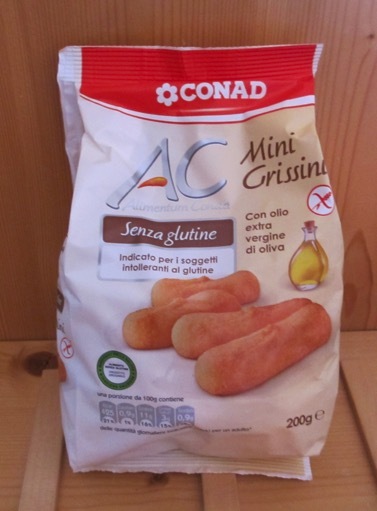 Breadsticks: Conad supermarkets make a palatable breadstick called "Grissini" in their "AC" line, which is their gluten free food label. Made with olive oil and no sugar, they counted as a wholesome food in our book. Compact packaging, fairly durable, tasty, and tidy finger food, they quickly became a favorite item to carry for snacks on hikes when we could buy them. Corn Flakes: many brands (including Kellogg's in Europe) contain barley ("orzo" in Italian) in sufficient quantities to make me ill. We settled for grocery store house brands that stated "may contain traces of gluten" though gluten-free corn flakes were occasionally available at twice the price. Flaxseed: if you are used to coaxing your gut along with flaxseed, you'll have difficulty finding it Italy; ground will be available at the M Preis stores in Austria; whole seeds are readily available in Germany but ground is difficult to find there. Gluten free bread/cookie/cracker products: after being served them for breakfast for 6 days at an Italian hotel, we vowed to stop eating them altogether. The rice cakes/wavers were safe but the other products tended to make us feel slightly ill for the next 6-8 hours, presumably from the "almost" food additives. Gnocchi: Potato-based pasta-type product that could be gluten free but rarely was. "Farina tipo '0' or '00'" usually appeared on the ingredient list in Italy, which are grades of wheat flour. The pharmacy-sold gnocchi was gluten free as well as a single product we found in one Despar's gluten free section (unrefrigerated) made by Rustichella d'Abruzzo. We'd boil it, which took about 10 minutes rather than the 2 minutes shown on the 500g (pound +) package, stir-in 150-200g of fake blue cheese, and dig in. A little more homogenous than I prefer in the flavor department but it was a huge relief to eat something that actually tasted good. This bag of gnocchi that sold for about 3.50€ was generous for 2 hungry hikers. Nuts: tend to be imported from the US and are very expensive, like $20/lb or so. M Preis markets in Austria however have reasonably priced walnuts if you search the floor-level shelves carefully and buy 2 packages at a time. Oats: need to specify "gluten-free" like in the US. We had hoped that cross-contamination with wheat would be less of an issue in Italy since the country produces less wheat than the US, but that's not the case. We never saw gluten free oats though did see one package that said "Contains gluten." The largest selection of gluten free we saw in 3 months was in an Italian pharmacy. Pasta: bright yellow corn and rice pasta is available in the larger grocery stores. We found it more palatable than the US brown rice products but it wouldn't pass for wheat pasta and it was difficult to get it cooked just right. Despar does make a tiny pasta called "ditalini", which is more palatable. Tortillas: are catching on in Italy but are only made from wheat or kamut. Bill runs a little short on taste buds and so often relies upon hot sauces or more salt to perk up his food. But even my more sensitive palate was craving flavor on the European spin of our gluten free diet. Our first hiking stay over with a kitchen for the season was in Riva del Garda and there were 3 markets in easy walking distance. I carefully surveyed the shelves of each looking for ways to return the pleasure to our dining experience. The potatoes, rice, and beans we were eating sucked up and hid everything I put on them for flavor. I bought a pre-mixed blend of paella spices for our rice which smelled heavenly when cooking but fell flat on the palate. I used substantially more of the paella blend the second time around and the peppery-burn was so strong that I could barely eat it but still had no real flavor. One store had a line of jarred black olive, dried tomato, and artichoke pates which I thought would provide a flavorful condiment for pasta salad lunches but they came up short for flavor when sampling each from the jar. None of the Italian balsamic vinegars at any of the stores were the real thing by our standards despite their governmental certificates: they were all blends with caramel coloring and didn't add the robust flavors we were counting on. A potato salad with vinaigrette became our first successful hiking lunch, though adding blu cheese like one online recipe suggested was odd and not worth repeating. Our pasta salads at home with marinated artichoke hearts, sun dried tomatoes, and feta or other cheese was certain to please both of us but our early Italian renditions weren't always completely eaten. The bean salads that I concocted for trail lunches didn't get rave reviews either. The beans seem to neutralize most any flavor I added. But with little else to choose from, bean salads made with 2 types of canned beans were our standard "on the road/trail" lunch for 3 months. An old regional standby in the Italian Alps is polenta, which we'd endorsed for our breakfasts for years when we had apartments with kitchens. Readily available pinto-like beans, cheese, olive oil and a bit of turmeric we brought from home gave us a filling and flavorful way to start the day. Even the quick-cook varieties of polenta tended to spatter when simmering and our gas burners at Riva could only boil, which added to the mounting frustration in the kitchen. One of our successes when staying in an apartment with a thick-bottomed pan and a cooktop that actually had a range of temperatures was a stovetop cornbread recipe. Much to my surprise, the first batch was edible even though I had to guess at the measurements. It uses universal, basic ingredients and is gluten free without needing to be modified. My rough estimate was that splitting a batch between 2 people gave each about 330 calories. We made a meal of it. Too many culinary failures, too many meals that we ordinarily would have thrown out because they bordered on being revolting had me briefly contemplating surrendering to a diet of chocolate bars and potato chips. The wholesomeness of our meals had already taken a dive by eating gluten-free in Italy and there seemed little to lose. Matters got worse during our first hotel stay after spending a month in apartments. The included breakfast offered a "senza glutine" option but I think that eating potato chips and chocolate would have been healthier. The products they served us were from the local supermarket so we could go there to re-read the labels of foods we had refused to buy. One corn-based product had corn as the third ingredient, after sugar and palm oil. Like when low fat products first came out, the "go-to" substitute ingredient for fat was sugar, and that was the case with gluten free as well. And of course, eating gluten free was overlaid on our already meticulous diet that severely limited sugar and eggs, and eliminated juices, red meat, cured meats, and trans fats. After feeling slightly ill after about half of our gluten free breakfasts at the hotel we vowed not to mention it at subsequent hotels. Instead when breakfast was included with our lodging we'd buy corn cakes to take to breakfast. Those gave us a vehicle for the sliced cheese that was usually offered and we also ate yogurt if it was available. Back in our room, we'd have several pieces of fresh fruit to make breakfast feel more complete. Chips of all kinds were banished from our diet back in the 1980's as we migrated to eating low fat, low saturated fat, no trans fats, and low salt. But the frustration of getting enough to eat on our gluten-free diet in Italy had me taking a second look and the longer I looked, the better chips seemed. Hardly wholesome by my old standards, they did meet many of my newer criteria including: no added sugar, no additives, and no gluten. The list of 3 ingredients (potatoes, sunflower oil, and salt) was reassuring. And given that my cholesterol of 117 was too low and I'd been advised to eat more saturated fat, they looked even better. In addition, I'd thrown in the towel on eating a very low salt diet after making myself quite ill for almost 2 months earlier in the year and only slowly recognizing the problem was too little salt. About the same time I finally established that my borderline high blood pressure wasn't salt-sensitive, so the additional salt was no longer a worry. The more bags of chips we ate and the more I pondered them as a new food group, the better they looked. Potato chip manufacturer's had clearly cleaned up their act since we'd last indulged. The chips we were buying had no hydrogenated fats and so contained no trans fats. And when I started scrutinizing the numbers, the amount of salt eaten when we split a 180 g bag of chips (about 900 calories) wasn't even enough to really boost my sodium level if it was low. Chips started as a joke, then moved up to being a "grab n' go food" on cycling days when we needed to pile on more calories than we'd planned for. But it was when I started comparing chips to corn flakes for breakfast that they wormed their way onto our regular menu. Corn flakes are high on the glycemic index (rapid blood sugar rise) which isn't good for me and devoid of fat, which I need a breakfast to keep me going. Potato chips on the other hand had a hefty load of fat for staying power and to counter the high glycemic index of potatoes. It seemed sacrilegious to eat chips for breakfast but perhaps it wasn't so foolish after all…. I gradually migrated from buying potato chips to the less-available tortilla chips because while still loaded with fat, they weren't as greasy to the touch as potato chips, which made them easier to eat. Tortilla chips were also a little more flavorful than potato chips and we were still craving flavor in our new diet. Even compared with polenta, tortilla chips looked like a reasonable alternative from a nutritional standpoint. Towards the end of the 3 months in Europe, I'd embraced chips as a new food group in my gluten free diet, and thank goodness. In early September we read the Consumer Report's 2012 research on arsenic in rice and were devastated by having our shrinking food selection get even smaller. In Europe it had been corn, rice, and potatoes for half of our day's calories and now we were down to potatoes and corn: at least the chips had added a bright spot in our spartan diet. As we turned our attention to returning home, tortilla chips starting look even more like a year round staple for us. We'd relied heavily on brown rice, brown rice tortillas, and brown rice pasta on our new gluten free diet in the States and now rice was out, with brown rice containing even more arsenic than white rice. We'd settled on getting fewer of our total calories from grains but we still needed a 'vehicle' for cheese and other foods and tortilla chips looked like the best alternative. Tortilla chips are cheap, flavorful, relatively nonperishable, require no preparation, and (in the US) are available over a wide spectrum of fat quantities and qualities as well as ranges in salt. The only real downside of chips for us as travelers 9 months of the year was their bulk when needing to carry a big stash, and of course the hazard of overeating. But Bill lost 8 pounds while in Europe this summer so "Please pass me the chips." Gluten-free meals were available on our Delta/KLM international flights between Portland and Amsterdam. But not being keen on eating additives, we'll skip the special meals entirely next time we fly and decline the regular meals as well. The process of reading the fine print on prepackaged foods and turning up our noses at several disagreeable smelling 'fresh' foods had us deciding that we'd rather not spend our time analyzing the offerings. We also realized that every flight would be highly likely to include a rice-based dish because of the short list of gluten free grains and we were now shunning rice because of the high arsenic content. We always bring an armload of fresh fruits and vegetables, nuts, cheese, and our essential after-lunch chocolate on the plane and seeing the airline's offerings convinced us that we might as well add a few more items to our carry-on and have complete control over what we ingested. We'd been home from Italy a mere week when the latest medical research again threw our devastated diet into chaos. Suddenly, we were dodging "FODMAPs" or "fermentable oligo-di-monosaccharides and polyols" at our table. A group of researchers published a well designed study in a highly reputable gastroenterology journal revealing that people without celiac disease but with self-described gluten sensitivity were very unlikely to be reacting to the gluten in wheat but instead to another substance called fructans. Gluten is a protein and fructans is a carbohydrate. Fructans shows up in all sorts of other foods as well, including beans, fruits, and vegetables. And fructans isn't the only culprit, with it and the other offending carbohydrates being nicknamed FODMAPs. After ditching wheat and then rice from our diet in 2013, we were hardly in the mood for another radical change and yet we were intrigued. We both felt substantially better off gluten and yet something still seemed to occasionally make us feel 'off.' Neither of us could find any pattern, any cause-effect relationship, so experimenting with eliminating FODMAPs from our diet was compelling though unwelcome. Unhappily, it had the potential to strip our menus of most of our favorite foods (but at least chips were still OK). We are currently in a transition phase, shifting to a moderate FODMAP diet. We are decreasing the quantities of borderline foods that we eat and eliminating major problem foods, like onions, garlic, and broccoli. And I've pulled out my recipe books looking for new foods and flavors to put the smiles back on our faces. When we wrap-up visiting with friends and again have 100% control over our diet, we'll shift into high gear with complete compliance on a low FODMAP diet. And then we'll wait and wait some more. Hopefully we'll both feel significantly better after a couple of weeks, at which point we'll begin the food challenges to see which specific FODMAP is irritating. Once we each have identified our demons, we'll then being the more tedious process of establishing acceptable quantities of each. We'll still have to cut the gluten though may not have to be as rigorous as we currently are. Hopefully we'll be ringing in the New Year with perfect clarity about how to eat so as to have perfectly happy guts.